The Revelstoke Nordic Day Lodge and Mount Macpherson trail head is seven kilometers south of Revelstoke on Highway 23, on the West side of the highway, at an elevation of 640 meters. We are “Revelstoke Nordic Ski Club” on google maps. 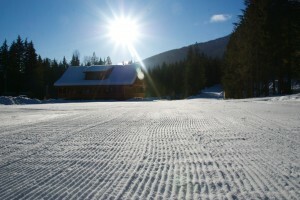 There are 26 kilometers of groomed trail. All trails are set for both classic and skating techniques. The lodge has a large eating area upstairs with a stove and warm drinks (by donation) and a boot change area and washrooms downstairs. There are 6 km of lit trails for night skiing from dusk until 9:30pm every night. Lit trails are Mickey Olsen loop, Evelyn’s Choice, Dynamite, Titan, the terrain park, and the stadium. Dogs are permitted only on the dog-friendly trails: Roadway Ramble, Easy Al’s, BCIT, Short Hop, and Ellie’s. The parking lot and stadium area is a mandatory on-leash area. Our complete Dog Policy can be viewed here, and the Dog Map can be viewed here. 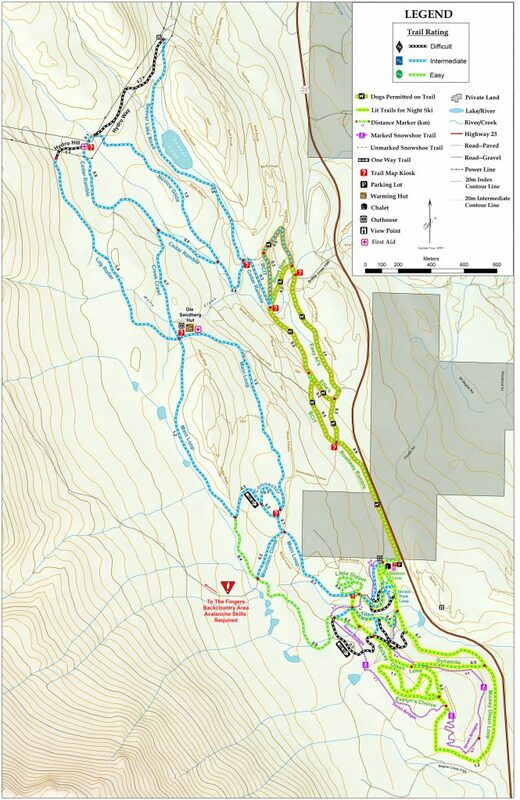 The Ole Sandberg cabin is 2.5 km from the parking area, at the junction of Main Loop, Log Roller, and Creek Crawl. The cabin is heated with a wood stove and has a covered porch. An outhouse is located behind the hut. First aid supplies and equipment (toboggan) are stored at the cabin as well. The cabin is not intended for overnight use. Come out and try the Seven Bridges snowshoe trail! It is 4.5 km of rolling terrain through forest and cutblocks. It roughly follows the Stimulus bike trail. Seven Bridges is dog-friendly, but be mindful it is near our ski trails so please keep your dog under control at all times. Snowshoeing is not permitted on groomed trails, except in those places where snowshoe trails cross over our XC trails. At these points, all users should exercise caution and respect. A parking fee is required to help cover costs associated with maintaining the parking lot and our day lodge, which you are welcome to use. Skiers coming downhill have the right-of-way. Slower skiers should give way to faster skiers. Faster skiers should give a courteous warning when passing slower skiers. Fat-tire biking is not allowed on RNSC groomed trails. You are responsible for your own safety when skiing the Macpherson trails. You can help yourself and others by carrying a cellular phone and being able to describe where your location. Should a situation arise where you or someone else requires assistance, contact Revelstoke Search and Rescue. They can be reached through the RCMP by calling 911. Revelstoke Search and Rescue is a volunteer group that maintains a snowmobile with a toboggan, and have members trained in first aid. Call ahead to the hospital, 250-837-2131, to let them know you are coming. While waiting for the snowmobile to arrive (this will take awhile), it is important to keep the victim warm. The club provides backpacks containing insulating pads, blankets, and first aid kits. These are kept at the Ole Sandberg Hut and at the trailhead booth in the parking area. The groomer also carries first aid materials. Always ski prepared. Bring water, extra clothing and snacks. Keep to the marked trails. For our complete Rescue Plan, please click here.